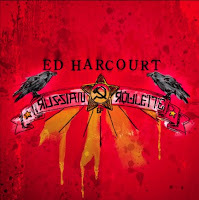 UK songwriter Ed Harcourt will release his new six-song EP, Russian Roulette on May 5 via online retailers. This is Harcourt's first new material in almost three years and is said to be a very personal bit of work. A full-length record is due sometime next year. Have a listen to the song "Caterpillar" from the EP. It was written about his daughter. Describing the song, Harcourt says, "It's the first song I've written about her. She was a little ill and we waited for her in the hospital for the chrysalis so we could take her home."